When Jimmy met Tony (1) on Saturday in Cameron Indoor Stadium, it was a seminal moment in the long and florid history of college basketball coaching tantrums. The Minutes ranks Boeheim's explosion at Tony Greene alongside the 2002 head-slapper from Indiana's Mike Davis against Kentucky as the most memorable freakouts of the 21st century. But among the many problems with Boeheim's completely unapologetic eruption is this: it promotes the mindset that the scapegoating of officials is acceptable. If you blame the refs when your team loses, you are a loser. That eternal truth needs to be repeated every so often – especially at this pressurized time of year, where difficult calls are scrutinized with a microscopic specificity and a level of outrage that is unhealthy for everyone involved. Twitter, message boards and call-in shows are veritable forest fires of ref-bashing both during and after games. The acceptance of an element of human error in officiating seems to be dwindling, which is not necessarily a good thing. Replay review has generally been a positive for all sports – but there will always be judgment calls, and some of them will be wrong, and that's just the way the ball bounces. Refs should be held accountable for their mistakes, and that includes public explanations of controversial calls, but there is a difference between criticism and vilification. Life is not fair, and an acceptance of that reality is helpful in all walks of life – sports very much included. Refs are going to miss some block-charge calls, because they're the hardest calls to make. And no number of slow-motion replays or frame-by-frame pictures will change that the day after. These are not murder cases where new DNA evidence can be introduced to change the outcome of a trial. "It's such a different business than even five years ago," said John Adams (2), the NCAA's national coordinator of officials, to The Minutes on Monday. "The games don't ever end." The concern here is this: that the level of condemnation and second-guessing will dissuade the next generation of competent officials from taking up the profession. Adams agrees – though not for exactly the same reason. "I worry about the very beginning levels," Adams said. "We wash out lots of young referees in the first couple years of working high school games and summer leagues because of the abuse they take from coaches and parents. "If you can get past that and get into college, it's usually OK. I have rarely had anybody complain to me about the crap they take from coaches at the college level." Still, the crap seems to come at refs in much larger doses from college coaches than NBA coaches. The Minutes has heard multiple college coaches with NBA experience say college officials tolerate far more flak than their counterparts at the highest level. It doesn't seem coincidental that the coach The Minutes has seen engage in the least ref-baiting all season is the coach with the most NBA experience: Larry Brown of SMU. • Prolonged, negative responses to a call/no-call, which is disrespectful/unprofessional and includes, but is not limited to: thrashing the arms in disgust, dramatizing contact by re-enacting the play, or running or jumping in disbelief over a call/no-call. • A negative response to a call/no-call including, but not limited to, approaching/charging an official in a hostile, aggressive or otherwise threatening manner, emphatically removing one's coat in response to a call/no-call or throwing equipment or clothing on the floor. • Continual criticism during a game regarding the same incident after warning by an official. Profanity is also a no-no. Which is ha-ha funny. Refs are taking a lot more of that than you may think. And then there is the coaching box, which gets less respect than the speed limit. Some coaches have been wandering as far as midcourt this year. John Calipari went onto the court at LSU to shove guard Andrew Harrison into motion on offense, with no resulting whistle. On Monday night against Syracuse, Mark Turgeon skittered halfway to Baltimore in the final seconds without an official ringing him up. Adams acknowledged enforcement of the guidelines is "uneven. There are some referees and conferences that do a notably better job." The refs in general need to curtail their conversations with coaches, too. There is way too much discussion going on, creating the perception that the zebras can be lobbied into or out of calls. Before the NCAA tournament, Adams said he tells the 100 officials selected to keep in-game dialog brief. "If you get a pertinent question and it deserves an answer, give a polite, concise answer and get on with the game," Adams said. And if the game doesn't turn out the way you like? Don't blame the refs. Amid the February stretch run, The Minutes tackles some key issues in each of America's top eight leagues. Who is the Player of the Year (3)? It's a compelling three-guard race between Cincinnati's Sean Kilpatrick, Louisville's Russ Smith and Connecticut's Shabazz Napier. Kilpatrick is the most indispensable offensively, scoring 29 percent of the Bearcats' points, making 34 percent of their free throws and 48 percent of their 3-pointers. Analytics guru Ken Pomeroy gives the edge to Smith, whose scoring average is slightly down from last year (18.7 to 17.5) but assist average is considerably up (2.9 to 4.5) and so are his field-goal percentages (41 to 46 overall, 33 to 37 from 3-point range). Napier is the most well-rounded, leading the Huskies in scoring (17.8), rebounding (5.9), assists (5.4) and steals (1.9). (The fact that a 6-foot-1 guard leads UConn in rebounding is an indictment of the team's big men.) Solution: to the victor belong the spoils. Whichever player's team wins the league should be Player of the Year, which right now looks like a two-man race between Kilpatrick and Smith. Who plays in the Quarterfinal of Death (4)? There figures to be three walkover games in the AAC tournament quarters, and one donnybrook between whoever winds up in fourth and fifth. This is the league with the greatest disparity between top half and bottom half, which means the top three seeds will draw from the dregs of the conference. But the Nos. 4 and 5 seeds will meet for the chance to play the regular-season champion in the semifinals. Right now the two teams ticketed for those spots are Memphis (the tourney host) and UConn, but Southern Methodist is only half a game ahead of the Tigers. The battle for third could come down to the last regular-season games, when the Mustangs visit Memphis and the Huskies visit Louisville. Of all the good work done by Larry Brown (5), is this the best? For a guy who has been a head coach since 1972 at 13 different places, that's almost impossible to answer. But in terms of elevating a program/organization, this has to rank right up there with reviving the San Antonio Spurs in the late 1980s and getting the horrendous L.A. Clippers to the playoffs in 1992 and '93. Despite taking over a program with no tradition and no momentum, the Mustangs are ticketed for their first NCAA tournament berth since 1993. Similar to Nick Saban at Alabama, it took Brown one season to get acclimated, and then it was time to start piling up victories in season No. 2. There have been 22 of them so far this year, SMU's most since 1988 – which happens to be the year Brown won the national title at Kansas. How good is Saint Louis (6)? The record is ridiculous: 25-2 overall, 12-0 in a tougher-than-expected league. Point guard Jordair Jett is a Minutes favorite, an alpha male point guard who should be the league Player of the Year. And the Billikens will guard till the last dog dies. But there is reason to wonder how well this team will translate to playing the kind of competition they will face in the NCAAs. If you use the Pomeroy Ratings as a yardstick, Saint Louis is only 2-2 against the top 50, and both those victories were at home. There are road games against No. 23 VCU and No. 44 Massachusetts still to come; maybe those will help show this team is worth its top-10 ranking. Hard to forget that the offensively laborious Billikens flopped last year in the NCAA tourney as a four seed, being routed by No. 12 Oregon in the round of 32.
Who else gets NCAA bids (7)? UMass, VCU and George Washington appear to be solidly in the field at the moment, although the Rams and Colonials have staggered lately and can't afford an all-out tailspin. Then it gets interesting. St. Joseph's (9-3) has risen to second in the league standings, and Richmond (8-4) and Dayton (7-5) both are loitering around the bubble as well. This league tournament could have as much bubble intrigue as any. When the smoke clears on Selection Sunday, expect to see five A-10 teams dancing. How problematic is the unbalanced schedule (8)? Here's what makes it hard to confidently rank the A-10 teams – there are 13 of them playing a 16-game league slate, which means you get some wide variance in strength of schedule. According to Pomeroy, no team in the top eight of the A-10 standings has played a top-four schedule – and league-leading Saint Louis has played the easiest slate to date. That's one more reason why the neutral-floor league tournament will be vital to figuring out how this conference truly stacks up. Is Syracuse (9) fading again? Boeheim was at his most snide when asked Saturday night about the Orange's two-game losing streak. "That's awful, isn't it? I just don't know what to do. I'll probably cry all the way home. I don't think we'll probably play anymore. I think we'll just give up." His team took a tiny bit of steam out of the Syracuse Backslide Theory Monday at Maryland, barely holding on against a team that badly needed the win. But let's revive this stat: through the first 18 games of the year over the last six years, Syracuse is 104-4. For the remainder of the regular season during that time, it is 61-24. Certainly, that factors in the 'Cuse's traditional home-laden non-conference schedule, but even taking that into consideration, this is a program that has not finished as well as it has started in recent years. We'll see what happens in the final three games: at Virginia, home against Georgia Tech and at bubblicious Florida State. Is Virginia (10) good or great? Speaking of unbalanced schedules: Pomeroy says the Cavaliers have had the easiest run to date of anyone in the 15-team ACC. They've only played Duke and North Carolina once each, and have yet to meet Syracuse. So there is a reason for being 14-1 in the league beyond just playing great defense. Hats off to Tony Bennett for a fine coaching job, but The Minutes isn't ready to declare a team that lost by 35 to Tennessee or scored 38 at home against Wisconsin to be Final Four material. How legit is the North Carolina (11) resurgence? Pretty legit. The Tar Heels have plenty of size and depth, and with Leslie McDonald coming on they are shoring up their perimeter shooting weakness. But the best thing about this team is its zeal for defense, which hasn't always been the case with Roy Williams' teams. (This is just the third of his 11 North Carolina teams that Pomeroy rates more highly defensively than offensively.) Even with two road games this week, expect the Heels to take a 12-game winning streak into Cameron Indoor to end the regular season. UNC will be a trendy Final Four pick by the times the brackets get printed. What to make of the twin towers of underachievement (12)? That would be Oklahoma State and Baylor. The Cowboys were picked as league preseason co-favorites alongside Kansas, and the Bears were picked third in the conference. Now, they are scrambling in an effort to avoid playing on the first day of the Big 12 tournament while the top six teams have a bye. Baylor (6-8) is currently in seventh (which means it would play TCU in the first round) and Oklahoma State (5-9) currently is tied for eighth (and would play Texas Tech in the first round). Despite some dismal basketball for long stretches, both teams still have a chance for at-large NCAA berths. The Bears have won four straight to give themselves a chance, and the Cowboys have won two straight after getting Marcus Smart back from suspension. Smart's absence during an 0-3 stretch will be taken into account by the selection committee. Both teams have the talent to not only make the tourney, but make a run in the tourney – if they've put their dysfunctional days behind them. Is Andrew Wiggins (13) ready to blow up? The consensus No. 1 recruit in the class of 2013 has fit in – rather than stand out – for Kansas so far this season. But that is a tribute to Bill Self's system and the depth of surrounding talent more than a knock on Wiggins – who, it must be said, is still the Jayhawks' leading scorer at 16.4 points per game. This is more a hunch than cold science, but The Minutes expects Wiggins to elevate his level of play heading into March – and especially the NCAA tourney, when Kansas is freed from the double-round-robin familiarity of the very competitive Big 12. He may not be ready to live up to the Best Prospect Since LeBron hype yet (or ever), but he may yet leave an indelible mark on college hoops. Is there a second Final Four contender (14) in the league? After Kansas, the pickings are slim. Plenty of good teams but only one that appears to have the chance to be elite. The Minutes loves Fred Hoiberg and the job he's done at Iowa State, but the Cyclones don't defend like a Final Four team – and it's hard to forget that no-show at West Virginia in which Iowa State surrendered 102 points. Oklahoma is well-coached but not lavishly talented. Texas has come back to Earth. Kansas State is a home-court phenomenon. And as mentioned above, Oklahoma State and Baylor have been too psycho to trust. The Big 12 has had just one program advance to the Final Four since 2004, and that's the Jayhawks. That doesn't appear likely to change in 2014. How far can Doug McDermott (15) carry Creighton? He's the national Player of the Year and there is no need to even debate it. McDermott has had his best season yet, and the three that preceded it were excellent as well. As Kemba Walker showed in 2011, a great player can take a team a long way – but can this great player take this team all the way? Or at least to the Final Four? The big question is defense. Creighton ranks 88th in defensive efficienc, per Pomeroy. Of the previous 40 teams to make the Final Four, only one was even close to such a low ranking – VCU was No. 84 in 2011. Everyone else was in the top 50, and most were in the top 20. So it's doubtful, but if Creighton wants a star-powered team that was great on offense but sketchy on defense for a hopeful comparison, try Marquette 2003. That Dwyane Wade-led group was second nationally in offensive efficiency and 119th on defense. Who is Coach of the Year(16)? It's a two-man race between Greg McDermott of Creighton and Jay Wright of Villanova. Expectations were slightly lower for the Wildcats than the Bluejays, and given the remaining schedules it's possible that 'Nova will slip past Creighton and win the league outright. But anything less than that is a clear mandate for McDermott. He took the program up a notch in terms of game-to-game competition from the Missouri Valley and it has flourished. And there is the small matter of wiping the floor twice with Wright's Villanova team. How do you sort the five bubble teams(17)? As of today, in the following order: Xavier, St. John's, Providence, Georgetown, Marquette. But the margins are thin between them, and only two or three of them are likely to make the Big Dance. Their records against each other: Xavier 4-3, St. John's 3-3, Providence 3-4, Georgetown 3-4, Marquette 3-2. Xavier visits St. John's on Tuesday and Georgetown is at Marquette on Thursday. Is it time to worry about Michigan State (18)? In a word, yes. Branden Dawson is still out. Keith Appling is back in name but not in game – his minutes and production and activity are way down. Gary Harris and Adreian Payne are having to shoulder a big load, and the result is a 4-5 record over the last nine games. Getting everyone back healthy and cohesive might be too difficult a task at this late juncture. If anyone can do it, Tom Izzo is the guy – but it won't be easy, and it now appears that the Spartans will head into the tournament with a lower seed than expected preseason. Is there a legit national title contender (19) in the league? On a few occasions since 2000, the Big Ten has been the best conference in the country. But it hasn't produced a national champion since Michigan State's Flintstones won it all 14 seasons ago. With the injuries at Michigan State, this could be another year watching the representative of another league cut down the nets. But there are two other teams that should at least be in the mix: Michigan and Wisconsin. The Wolverines are the presumptive regular-season champions and have a lot of intriguing pieces in a well-oiled system. After a mid-season crisis, the Badgers are back to playing great, but they still have the Bo Ryan Final Four Titanium Ceiling to break through. There are better candidates elsewhere. Why is it a bad year for suit coats (20)? Because the top two candidates for Coach of the Year refuse to wear them. Michigan's John Beilein is a roll-up-the-cuffs type on the sideline, and Nebraska's Tim Miles is a shirt-and-tie guy too. Beilein has overcome the loss of lottery-pick center Mitch McGary in December and should win the league. Miles has overcome decades of ennui in Lincoln and has the Cornhuskers in the mix for their first NCAA bid since 1998. Either would be a worthy winner. Is Arizona (21) back among the top title contenders? You bet. After a bit of a wobble following the loss of forward Brandon Ashley for the season, the Wildcats seem to have gotten back to nasty defensive business. They're 4-2 since Ashley went down, with the two losses by a combined five points on the road against probable NCAA teams. Aaron Gordon was at his explosive best against Colorado on Saturday, after a foul-plagued disaster at Utah. This is a team on a straight path to a No. 1 seed in the West. Are we undervaluing UCLA (22)? Probably. This isn't a fly-under-the-radar program, but the Bruins have been for weeks. They had a bad loss at Oregon State but are 21-6 overall, 10-4 in the league, and are a good bet to win their last four regular-season games. In Kyle Anderson they may have the most versatile player in the country, and Jordan Adams also is a pro-level player. A lack of big-time wins may hurt UCLA when it comes to seeding, but this is a team with dangerous talent. What to do with Oregon (23)? If the Ducks make the Dance, it's a sure sign of a soft bubble. They have a losing record in the league and haven't had a noteworthy win since Jan. 2 (if an OT victory at Utah qualifies for that distinction). It would seem like a yoga master stretch to cite Oregon's season-opening win over Georgetown as reason for inclusion. The Ducks had better win the Pac-12 tourney, or at least make a deep run in it. Should we buy the spin (24) that the SEC is underrated? Please. Kentucky touted media members Sunday on a piece on the school's blog suggesting that the SEC is a more competitive league than it is given credit for being. The first statistic cited number of teams ranked in the top 100 in the RPI, Pomeroy and ESPN's BPI, noting that the SEC measures up well with every other power league in the country. Which is fine, except for the fact that the NCAA tourney is not a top-100 event. It's a top-50 event, and when it comes to that, the league does not stack up. There are three SEC teams in the Pomeroy Top 50, which is fewest among the eight strongest leagues. So if you're looking for a conference that should dominate the NIT, the SEC may be it. But this isn't a league in very good position to lobby for as many NCAA bids as its peers. How much coaching turnover (25) will there be? There could be a lot, or there could be just one. Tony Barbee would seem to be the most endangered at Auburn. But there is plenty of grousing about Anthony Grant at Alabama, Mark Fox at Georgia and even Cuonzo Martin at Tennessee, too. Mississippi's Andy Kennedy has a single NCAA tournament appearance in his first seven seasons, and this one will end in the NIT unless the Rebels win the SEC tourney. And a third straight year without an NCAA bid would not play well for Mike Anderson at Arkansas, and Billy Kennedy is not close to getting Texas A&M back into the tourney in his third year. The good news for many of these embattled coaches is that the schools simply don't care too much about basketball. Jabari, Julius or a greater Gator (26)? That is the MVP race in the league. Jabari Brown of Missouri is averaging 20.2 points and 4.6 rebounds, and has bailed out the Tigers with a plethora of big hoops in close games to keep Mizzou in NCAA bid contention. Julius Randle of Kentucky is averaging 15.7 points per game, despite only taking 9.5 shots per game, and is second in the league in rebounding. But if Florida runs the table in the SEC, it will be difficult to deny a Gator the award – the only question is which one. Tough call between point guard Scottie Wilbekin and wingman Casey Prather. Boston College (27). Team the Eagles beat: Syracuse, in an emotional overtime upset last week in the Carrier Dome. But that's not all. In the earlier meeting in Chestnut Hill, 20-loss BC led for nearly 10 minutes of the second half before succumbing. Auburn (28). Team the Tigers scared: Florida. On the same night Boston College stunned Syracuse, sub-.500 Auburn led most of the game before self-destructing in the final 20 seconds. Asauhn Dixon-Tatum got the score wrong and intentionally fouled Florida's Patric Young in a tie game, and then, trailing by two, the Tigers threw away the inbounds pass. In two games against the Gators, Auburn has never trailed by double digits in the second half and has been within a single possession in the final minute of both. Utah (29). Team the Utes scared: Arizona. Also on the same night last week, Utah rallied from 12 points down to take a couple of one-point leads late in regulation against the Wildcats. But 86 percent foul shooter Jordan Loveridge missed one of two with 28 seconds left to send the game into overtime, and Arizona pulled it out. Last month in Tucson, when the Wildcats were unbeaten and bulletproof, Utah played Arizona to a standstill for 31 minutes, and were within single digits for 36 before relenting. It has not been a glorious basketball season for Samford. The Bulldogs are 11-18 overall, 5-9 in a very weak Southern Conference, and seemingly ticketed for their fifth straight losing season. But amid the doldrums, athletic director Martin Newton has hit upon a marketing slogan to enliven things and drive home the difference between the small school in Birmingham, Ala., and the slightly more prestigious school with the similar name in Palo Alto, Calif. Thus the Bulldogs present the Sam Not Stan (30) T-shirt. Almost every alum has had to explain, often, that they went to Samford, not Stanford. And now here is the shirt to do the talking for them. Maybe the fans will wear them en masse for their (likely brief) trip to the SoCon tournament in Asheville, N.C. The Minutes was sent an advance copy of a book that should be an enjoyable read for folks on Tobacco Road and college basketball historians everywhere. "Bones McKinney: Basketball's Unforgettable Showman (31)" by Bethany Bradsher is an intriguing look at the Wake Forest coach who has been overshadowed by those who came before and after him in North Carolina's basketball epicenter. McKinney never won a national title like Frank McGuire, Dean Smith, Norm Sloan, Jim Valvano, Mike Krzyzewski or Roy Williams. But he remains the only coach to take Wake Forest to the Final Four, doing it in 1962. And Bradsher's book illuminates a consummate sideline ham who was also a Baptist minister and father of six children. At a time when Wake Forest basketball is at a low ebb, this book on Bones should be a welcome reminder for Demon Deacons fans of what the program can be. Louisville (32). The Cardinals checked the final box on their NCAA resume Saturday at Cincinnati, earning their first victory over a ranked opponent on a Russ Smith shot with two seconds left. That ran Louisville's AAC road record to 7-0, with trips remaining to Memphis on Saturday and SMU on March 5. Rick Pitino's team is starting to look capable of a third straight Final Four. Middle Tennessee (33). The Blue Raiders swept road games at Charlotte and Marshall, running their road winning streak to five games and their overall winning streak to nine. Middle Tennessee now leads Conference USA and recently put together a blistering three-game tear, beating Tulane, Southern Mississippi and Charlotte by an average of 22 points. Harvard (34). The Crimson has played four straight road games and won them all by an average margin of 14.8 points, reasserting Harvard as the Ivy League team to beat. Tommy Amaker's team is a perfect 5-0 away from home in Ivy play. North Carolina Central (35). The Eagles have stormed into first place in the MEAC on the strength of 13 straight victories, six of them on the road, including the last three in a row. It would be a shock if North Carolina Central does not represent the MEAC in the NCAA tourney. Wichita State (36). Also known as the Kings of the Road. Their 14-point victory last week at Loyola Chicago leaves just one more away game to handle on the quest for an unbeaten regular season – at Bradley on Tuesday night. The Shockers are a whopping 13-0 away from Wichita. Karvel Anderson (37), Robert Morris. If you like shooters, you have to like what Anderson did last week, lighting up LIU-Brooklyn and St. Francis (N.Y.) for a total of 57 points. The senior guard has made 95 3-pointers and is shooting 47 percent from outside the arc for the season. And even some of his misses work out well: a 3-pointer that bounced off the rim against St. Francis was tipped in with three seconds left by teammate Lucky Jones for the win. Craig "Noodles" Neal (38), New Mexico. 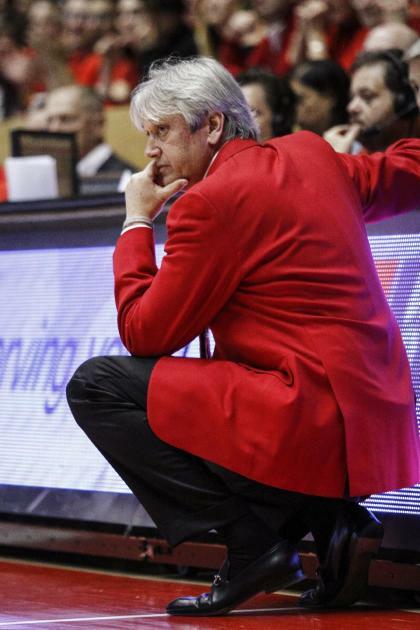 The rookie head-coaching replacement for Steve Alford has quietly kept the Lobos on track. Their home beatdown of San Diego State on Saturday and authoritative handling of UNLV three days earlier in Las Vegas may establish the Lobos as the team to beat in the Mountain West, after a season in which all the attention has gone to the Aztecs. New Mexico has won nine of its last 10, with the lone loss by a single point at Boise State. Trent Johnson (39), TCU. There is one team among the top eight conferences that is winless in league play. That team is Johnson's Horned Frogs, now 0-15 and hopelessly non-competitive in the Big 12. TCU has not won since 2013, and has not come within single digits of an opponent since Feb. 4. There have been six league losses by more than 20 points. This is a bad program that was in bad shape when Johnson took over in 2012, but they're not paying him a reported $1.5 million per year plus incentives to keep it bad. When hungry in Chapel Hill, The Minutes strongly encourages a classy and tasty meal at Elaine's On Franklin (40). This is upscale college-town fare, and worth it. Try the pork chop with spinach, macaroni and cheese, and grilled apples. Then head out to the nearby bar scene on famed Franklin St. Thank The Minutes later.